I have two vivid memories in relation to Star Wars: Rogue Squadron. The first is the Easter that came after I got the game. I don’t remember the circumstances under which I received the game proper (it was likely a Christmas gift), but I do remember that on that Easter, I got the Official Nintendo Player’s Guide for it as a gift. We also went to the Royal Fork Buffet for Easter dinner that year, and I brought the guide along with me so that I could study the game and how to earn the gold medals and unlockable ships. It was also the last time I can recall enjoying the Royal Fork Buffet. Maybe the food there used to be better, maybe I just didn’t know better becaue I was a child. We may never know the truth. Also we got the PC versions of Rayman and Earthworm Jim, but I was much less interested in those. I want to say I chose to play Rogue Squadron in April because it and Easter have a permanent link in my mind, but really I’m not that clever. It’s April’s game of the month because that’s just how things rolled out. Pure coincidence. The other thing is an in-joke that my friends and I had. We would occasionally should out “Ry wichypa!” because one of the characters in the game said it. What he was actually saying was “Right with you, boss” and we weren’t able to make it out because the recording quality is so-so. 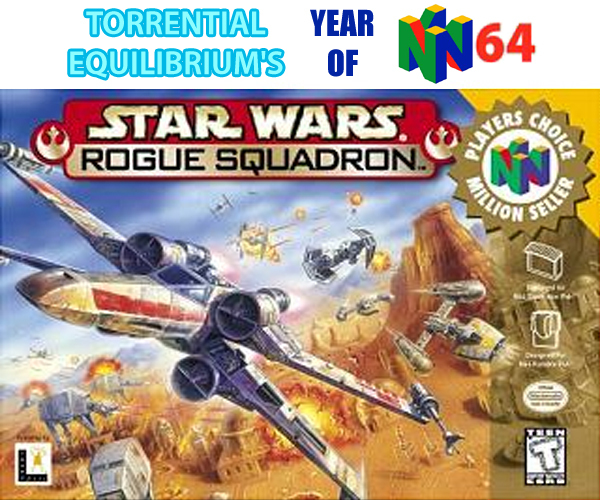 When I booted up Rogue Squadron for the first time in a decade, I steeled myself for the worst. I remember having nothing but love for this game back in the day, and I was fully prepared for it not to have aged well. But lo and behold, it did! Aside from a few strange control choices, I was able to pick the game up and really get into it right away. Goldeneye 007 took a few levels to acclimatize to, but with Rogue Squadron I was blasting TIEs like nobody’s business after only one mission of warming up. The strange control choices I mentioned are twofold: The most immediately noticable one is that on the menus, you have to tilt the control stick all the way for it to have any effect. If you only push it slightly to the side, you’ll notice that nothing happens. It’s not a big thing, but it’s really jarring. It’s actually easier to navigate menus with the D-pad, and holing the N64 controller by the left prong feels all sorts of weird. The second odd thing is that the B button is shoot and the Z button is brake. This setup is totally counterintuitive to any other game with a shooting action on the N64… at first. When you play your first mission in a Speeder, you may notice that the Z button only controls the left brake. The R button does the right brake, giving you increased control over your turns when piloting the speeder. It’s not a terribly useful feature, and it still feels weird to shoot with B, but at least there’s a method to the madness. Rogue Squadron is a ton of fun, and I think part of what makes it so perfectly tailored to my tastes is that the missions are rather short. I think the longest ones hit around ten minutes, but most end in closer to five. If you’re really good, you can even whittle the shortest ones down to two or so. This is excellent for me, as I don’t have tons of free time, and being able to cram a lot of missions into a shorter timeframe make sit feel like I’ve accomplished a lot more than playing one or two really long levels. In fact, that’s probably the only reason I couldn’t get into Lollipop Chainsaw. The game also gives you a ranking on each mission, which is another great reason to have short levels. If I have to spend half an hour playing a stage only to receive a poor score, I’m much less likely to replay for better ranks, and therefore less likely to replay the game in general. But if I can just practice a short level over and over again, there’s a much higher probability that I’ll actually put in the time to get good at the game. And if I’m playing that much anyway, I’ll probably come away with a higher opinion of the game, too. Rogue Squadron does a great job of easing up the difficulty level. On the first handful of missions, it’s almost unbelievably easy to earn you some gold medals. I even earned a couple on my first time through. Though soon, you’ll start dying more, and eventually you’ll get to the point where you have to replay a mission a couple times just to earn a bronze. By the end, things are hectic and you’re happy to have just passed the stage. But it’s always fun. As long as you’re not terrible at it, Rogue Squadron is gentle enough that it doesn’t get overly frustrating. If you do need a helping hand, Rogue Squadron gives you plenty of ways to improve your game. In a hanful of missions, you can find a permanent upgrade for your fleet of fighers. Though you have to complete the mission for it to count, each upgrade lasts forever once found, and you can even go back to previous missions with powered-up ships. There are also a ton of passwords, wand while most are just for fun, several are quite handy. There’s the obvious invincibility code, and then others that unlock special ships like the Millennium Falcon and a Naboo Starfigher, which are much hardier than your normal choices. The nice thing about using passwords is that they don’t have any adverse effect on your game. If you want to cheat your way to those gold medals, you’re totally free to do so. You won’t even get called a poseur or anything. Rogue Squadron is a wonderful game, and also a really top-tier Star Wars product. The story beats of the game happen around the events of the original trilogy, but almost all of that content is original. The only game levels that actually take place during the movies are the Death Star Trench Run and Battle of Hoth stages, both of which are unlockable bonus levels. While you spend the majority of the game playing as Luke Skywalker, Rogue Squadron also gives some minor movie characters time to shine – Wedge Antilles and General Rieekan specifically, but Dak, Janson, Hobbie and Zev are all there too. Han and Chewie even make a couple of cameo appearances. The characters and story are all just gravy. What did you really come for? To fly some damn X-Wings, that’s what! And fly X-Wings you shall. Also Speeders, A-Wings, Y-Wings and the original V-Wing. Each craft is totally unique and has a very different playstyle from the rest. As mentioned before, the Millennium Falcon and Naboo Starfighter are unlockable, and they’ll give you quite an advantage over your enemies. Lastly, you can also unlock a TIE Interceptor. It’s more of a liability, what with it’s lack of shields and all, but is still fun to zip around in. Quite frankly, the only thing missing from Rogue Squadron is any sort of multiplayer mode. Co-op versions of this game’s missions were included in the GameCube sequel, but there’s nary an option for multiplayer here. Which is super odd, considering how that was sort of the N64’s bread and butter. Oh well. It’s still an unbelieveably solid game, and I honestly can’t think of anything I’d add to an HD remake besides graphical improvements. Rogue Squadron is pretty much perfect just the way it is.